MOSCOW, March 28. /TASS/. London’s six-slide presentation entitled the ‘Salisbury Incident’ allegedly proving Russia’s complicity in the so-called Skripal case fails to stand up to any criticism, Kremlin Spokesman Dmitry Peskov said on Wednesday. "To our great regret, up to now we have not seen any adequate or comprehensible proof or explanations whatsoever on the position held by official London," the Kremlin spokesman said. "London has not provided any information to the Russian side," Peskov stressed. "The reports we saw in the media, which claim that precisely such information was presented as arguments, can barely stand up to any criticism," the Kremlin spokesman emphasized. The British Embassy in Moscow held a briefing for foreign envoys where it presented the UK’s view on the alleged poisoning of former Russian intelligence officer Sergei Skripal convicted in Russia for espionage. Several countries that sided with London on the alleged Skripal poisoning case consider their arguments weak and inadequate, Peskov noted. Replying to a question on whether the Kremlin believes that Russia's non-involvement defense in the alleged Skripal poisoning is a dead-end, Peskov said, "No, we do not believe that. First, 20 or 30 countries are just a part of the world community; it is much more diverse and includes a much larger number of nations. Second, even among the countries that sided with the UK, there are states that still believe that London’s arguments are weak and inadequate for such serious accusations against Moscow." Peskov pointed out. Moscow expects those countries that have expelled Russian diplomats to question the reliability of London’s allegations about Russia’s involvement in the Salisbury incident, the Kremlin spokesman stressed. According to him, Russia has taken a clear and consistent stance on the issue, denying its involvement. "We expect that the countries who decided to expel our diplomats in solidarity with Great Britain will eventually see the need to ask themselves whether the information that is being presented as evidence of Russia’s alleged involvement in the Salisbury events could be considered reliable," Peskov said. The Russian presidential spokesman said that the decision to expel Russian diplomats was "an example of quasi-solidarity with London on a matter that, from our standpoint, is totally baseless." The six-slide presentation largely included information already circulated by the media. The first slide is a title sheet while the second presents a chronology of events in Salisbury where Skripal was poisoned. The third and fourth slides give brief information on the nerve agent the UK calls Novichok. The presentation claims that only Russia could produce such chemical agents and gives information on their effects on humans. The fifth slide enumerates everything that the UK blames on Russia: Crimea’s re-integration, the crash of the Malaysian MH17 airliner over Ukraine in 2014, the interference in the 2016 US presidential election and the attempt of a coup d’etat in Montenegro. In conclusion, the presentation highlights measures the UK has taken or plans to take against Russia. A number of EU member countries, the United States, Canada and Australia earlier announced the expulsion of Russian diplomats over the alleged poisoning of former Russian military intelligence (GRU) officer Sergei Skripal, which the UK blames on Moscow without providing any evidence. In particular, Washington expelled 60 Russian diplomats, including 48 embassy staff and 12 members of Russia’s Permanent Mission to the United Nations. In addition, the US authorities decided to close Russia’s consulate in Seattle. The Russian Foreign Ministry stated that those unfriendly actions would not remain unanswered. 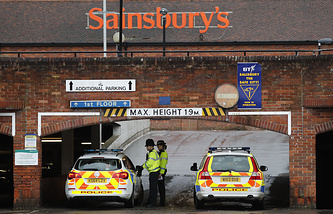 On March 4, Skripal and his daughter Yulia suffered the effects of an nerve agent in the British city of Salisbury. UK Prime Minister Theresa May rushed to announce that the alleged substance used in the attack had been the so-called Novichok-class nerve agent developed in the Soviet Union. Subsequently, London expelled 23 Russian diplomats. In response, Moscow rejected all of the United Kingdom’s accusations, saying that a program aimed at developing such a substance had existed neither in the Soviet Union nor in Russia. In retaliation to the UK’s steps, 23 British diplomats were expelled, the British consulate general in the city of St. Petersburg was closed and the British Council’s operations in Russia were terminated.